Do you know that we have two species of monkeys in Singapore? Besides the long-tailed macaques that are commonly seen in nature parks and forest edges, we also have the Raffles’ banded langur (RBL), a critically endangered monkey that is only found in the Central Catchment Nature Reserve. This monkey is mostly black in colour, with white bands on the inner thighs and down its chest. It is roughly twice the size of a long-tailed macaque. Shy and elusive, the Raffles’ banded langur rarely descends to the ground, and is highly dependent on continuous forests. In order to conserve them, we have to ensure that remaining habitats continue to be protected, and that forest fragments are reconnected. 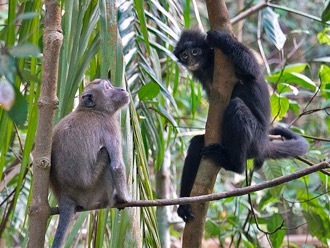 The Raffles Banded Langur is roughly twice the size of a long-tailed macaque (left). Photo by: Nick Baker. The RBL is also found in Johor, Malaysia. But unlike in Singapore, there is one more langur species in Johor – the dusky leaf monkey! Both species look quite similar that people sometimes mistake one for the other. And because the dusky leaf monkey is relatively common, it can occasionally give the incorrect impression that the RBL is also not threatened. On the contrary, the RBL is considered uncommon and little is known about its ecology in Johor. The RBL Working Group was formed in August 2016 through the partnership of various organisations and agencies in Singapore and Malaysia, including Wildlife Reserve Singapore, National Parks Board, Jane Goodall Institute (Singapore), National University of Singapore, Nature Society (Singapore), Malaysian Nature Society Johor, Perhilitan, and universities in Malaysia. The Raffles’ banded langur thrives in intact rainforest, ranging freely in viable, connected populations, widely appreciated and well-understood. As a valued part of the natural heritage in both Malaysia and Singapore, it exemplifies synergistic conservation collaboration across its range. the rainforest habitat of the taxon is intact, where necessary restored, and safeguarded. wild populations are connected where needed. genetic and demographic viability are ensured. its taxonomy and systematics are clarified, and the biology and ecology of the taxon are well understood. long-term monitoring and conservation research are in place. there is strong public awareness and government support. cross-country collaboration is strengthened and long-term financial support has been secured. A Species Action Plan was developed during a conservation workshop held at the Singapore Zoo on 1-2 August 2016, and is available here. For more information on the langurs, research activities and volunteering opportunities, please visit here.